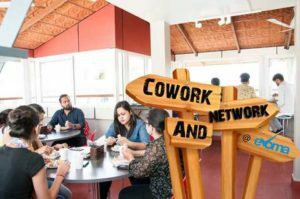 How do startups select a good coworking space in Bangalore? Location matters, obviously. That’s why the Evoma Business Centres offering serviced offices for SMEs, startups and corporate branches in Bangalore are located strategically in Whitefield, EPIP Zone, Marathahalli – Outer Ring Road, and in K.R. Puram on Old Madras Road. But when it comes to coworking, there’s a lot more that you have to consider apart from location. So I’m sharing with you here the the six key desired features to look for when it comes to coworking space for startups. As per a Knight Frank study, Bangalore startups can save between 72-76% of their office rental and operational costs by choosing to cowork. In fact, we recently published a post on how a coworking hub reduces office rent and costs – it shows that even if you take a full day pass to cowork 5 days/week, you still only spend Rs. 6,000 per month compared to over Rs. 22,500 for a month of office space rental. People are fed up of being forced to choose between free but slow Jio vs expensive data charges on other networks. Why can’t we have free, reliable and super-fast WiFi? Yes, you can – if you are in the Evoma coworking space in Bangalore. Note that it remains free and fast only if everyone follows the coworking etiquette of not hogging the WiFi. The grass is always greener on the other side. If you are locked up in an office cubicle, you want to be outside having fun. But if you are coworking, you may start missing the privacy you had in your own private office. Now you can enjoy the benefits of coworking, and also make use of the quiet zones and privacy in the Evoma meeting and conference rooms, library, business garden, and even the telephone booths. Let’s face the facts – the only way you can get an app developer or progammer to work through the night is by providing coffee and tea on tap. You also need to ensure there’s a cafeteria or restaurant nearby that’s open 24/7 and ready to feed your workers any time they need to refuel or take a break. That’s why Evoma has an in-house rooftop cafe, so you don’t have to go out to eat and drink. One of the things you take for granted in your own rented office space is the address and mail. But if you’re working out of a coworking space, what happens when you’re not there? Suppose you call a client for a meeting, and you’re late? What address are you going to put on your business cards, letterheads, website contact address, and other such things? How about if you want to receive mail from your bank, correspondence from your clients, or a package by courier? All these issues are taken care of if your coworking space offers virtual office services. 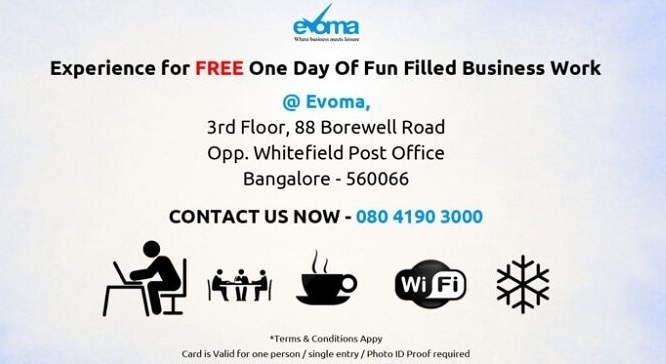 That’s why Evoma offers it’s coworkers the option to make use of our virtual office package that includes a great business address in Bangalore, mail forwarding, reception desk to take calls, and more. One of the main reasons why people come to our shared office spaces is because they feel that energetic vibe running through the place. You have young working professionals and highly successful entrepreneurs all around you. It gives you that energy and creative inspiration needed to be an innovator yourself. If you want to feel this energetic vibe at the Evoma coworking space in Bangalore, come and try it free for a day. Contact us now.